Culling us isn't a simple solution to any problems we cause, nor any problems we are falsely accused of causing. While it seems obvious that killing us would solve any problems permanently, the fact that there are so many of us makes this not necessarily the case. When you cull fairly large numbers of us, yet the resources of food we rely on are unchanged, those of us left will have more food to go around. In turn, this means that we will breed much more efficiently, and the survival rate of young will be greater. This can lead to the population density actually increasing in a fairly short timescale, and any problems we previously caused will be worse because there will be a large number of highly active juveniles quickly appearing. Not only that, but other grey squirrels from neighbouring areas will move into the void created by the culling activities. Combined with increased breeding performance from those missed by the culling, this can create a very significant increase in population density, and all the problems over-population can cause. This will eventually come back in to equilibrium, but the problems caused can be very long lasting. Squirrels filling voids from neighbouring areas don't just cause temporary over-population. 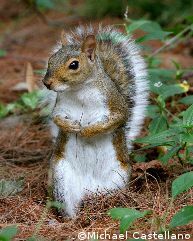 Supposing a conservation organisation wishes to cull grey squirrels to protect red squirrels, then the culling can cause an influx of grey squirrels from neighbouring areas. If the reason for the cull is to control the spread of disease, which is of course debatable, then increasing population mobility from surrounding areas is only going to increase the risk of spreading any disease. This could have the reverse effect of accelerating decline of reds if the conservationists were correct about poxvirus. So, whether or not you believe conservationists about poxvirus spreading from grey squirrels, culling is certainly not an answer. Whatever your view is on us, it is entirely unacceptable to be unnecessarily cruel to us. In culls in the past, humans have made an effort to avoid killing creatures which may be carrying young or bringing up young. However, the conservation organisations actively involved in the current culling of grey squirrels seem to have absolutely no regard for the cruelty involved in culling lactating mothers. They appear to count it an advantage that a few kittens will starve to death, because it saves them killing more of us in future. A truly unbelievable lack of compassion. It is an awful reflection on humanity that such an activity can be considered acceptable.